The common occurrence when a backcountry adventure turns into a quest far beyond the original plan. Reaping the benefits of having the best backyard in the world. Grand Teton National Park has been my backyard playground since I was a kid. My parents raised my two brothers and I amongst the lakes and forests of the mountains. I spent high school testing my independence and acquiring mountain skills in the Tetons. And now as an “adult”, the park has become a training ground for future adventures. I’m biased, but would happily be in a long argument over beers over why it’s the best National Park in the country. It’s the ultimate playground, no matter the season. We are so lost. Or rather, just so off trail. Because you can’t be lost if you technically know where your destination is, right? My legs, and my best high school adventure partner Emily’s legs, looked like we had just battled with a gang of feral cats. We found ourselves bushwacking for what must have been the fourth or fifth time that day. Our goal, Lake Taminah, was still hanging above us. But first we needed to get off the side of the hill and back into the talus field. Maybe we should have been concerned, but mostly we were giggling at the fact that I had been up this “trail” at least five times and still managed to have us this far off course. Springtime in the Tetons summed up in one shot. Hadley Hammer photo. My dad first took me up Avalanche Canyon when I was fairly young. Ever since, the canyon has become a yearly retreat. It felt like he was sharing one of the park’s best secrets with me. Avalanche Canyon is one of the lesser visited southern Canyons of Grand Teton National Park, and the trail is not maintained by the park. The bushwacking is intense, the talus field is long, and you’re bound to run into a bear or a moose or twelve. It is wild - a far cry from the more popular, groomed Phelps Lake or Lower Saddle hikes. It’s where I tested my navigational skills as a teenager, and then learned how to recover when I got lost regardless. 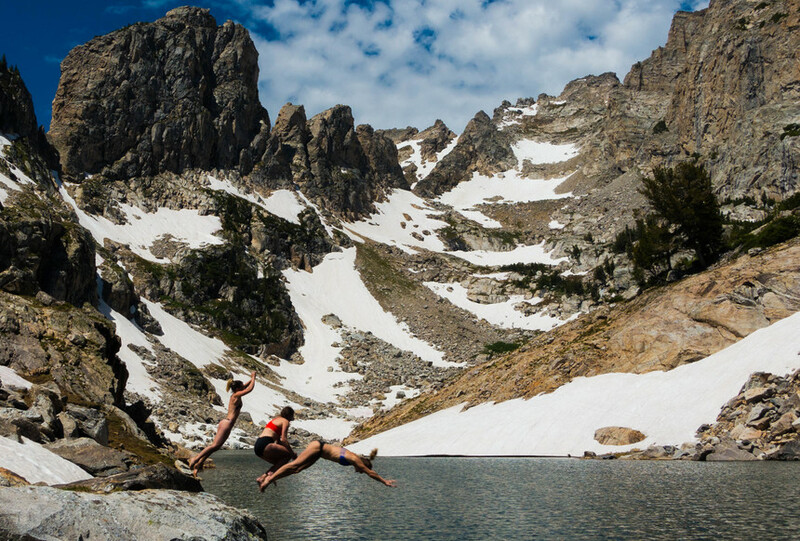 It’s where I found my love of jumping into frigid alpine lakes. It’s where I go to remember why I live in Jackson, even in the middle of August when tourists and traffic are infuriating. Emily and I eventually made it off the side hill, through the swamps and up the talus field to the lake. We took our clothes off and jumped in. Then we giggled and fumbled our way back down the “trail.” Every summer, whether it’s with my dad, Emily, other friends, or solo, I go up the canyon. And every time I get “lost,” jump in the “lake,” and laugh like I’m 12 years old again. Avalanche Canyon is accessed from the Taggart Lake trailhead. It is not marked or maintained. I think everyone should go on epic adventures like this, but I would suggest doing this one with a partner, preferably someone who has gone up before (and who has a better memory than I do). I learned the art of “off the couching-it” in the Tetons (a.k.a. going on adventure that you have not trained for in the slightest). I am always eager to say yes to anything, before my brain catches up reminding me that I’m not a runner so maybe a marathon is aggressive, or I haven’t skied a spine so skiing one that’s never been skied before is aggressive, or that I don’t have any altitude experience so skiing at 18,000 feet is aggressive. Lucky for me, growing up in the Tetons has given me plenty of experience at learning on the fly. Historically, Jackson summers were when I would work as many jobs as possible in order to save enough money to compete during the ski season. This meant weeks on ends of doubles and sometimes triples of unglamourous jobs like window washing, gardening, and waitressing. In the middle of one particularly draining summer, my friend and Exum guide Brenton Reagan asked if I wanted to climb the Grand Traverse for an Exum photoshoot. The Grand Traverse involves hiking and climbing 10 peaks, nine over 12,000 feet including the Grand Teton, with 20,000 vertical feet up peaks and valleys. And while I was definitely not a couch potato and was starting my work days with hour long gym sessions, I hadn’t been hiking or climbing more than three times that summer. But Brenton believed in me, and like I said, I have a hard time saying no to any adventure. So off we went. We climbed Teewinot in the dark, trudged on to Mt. Owen, and stood on the Grand Teton, the tallest peak in the park’s range after climbing the Italian Cracks, a 5.7 multi-pitch climb up the exposed North side of the Grand. We ended the day by hiking down to the lower saddle finally resting between the Grand and Middle Teton in the orange glow of the sunset. Unfortunately the photographer blew out his knee, so we didn’t finish the entire traverse, but we had a great day climbing a route called the Corkscrew on our way back down the valley. It was a lesson that no matter how tired or unprepared I was, that my body has an incredible reserve to keep going, especially when there are epic sunrises, peaks, crack climbs, and sunsets to experience. Exum Mountain Guides are one of the premiere guiding services in the world-the oldest in the US. Based in the Tetons, they are available for a variety of services ranging from begining day climbs to adventures such as the Grand Traverse. I would highly suggest going out with one of their accomplished guides for a truly unique Teton adventure. “Call your mother,” read the note left by the park rangers. The parking lot was dark and empty, save my dad’s car and the light of our three headlamps. My college boyfriend Matt, my father, and myself had returned from climbing Baxter’s Pinnacle. Baxter’s PInnacle is a Teton classic. With a short approach (uncommon for the range), and moderate 5.8 climbing, it’s a perfect adventure, one that my dad thought it would be a great adventure to take my new boyfriend on. While this may have been taken a few years back, not much has changed. Hadley Hammer photo. We might have started a little bit late, took in the views from the top a little too long, and Matt and I tangled our ropes a little bit. We missed the boat across Jenny Lake by a few hours (come to think of it I think we must have taken one of the last boats over to begin the adventure), leaving us to stroll in the pitch black around the lake, returning to our car close to midnight. My dad was unphased by the timing of our outing. And truth be told my mom was fairly unfazed as this wasn’t atypical of my father. My dad, a calm buddhist who resembles Santa, is one of the least intimidating humans I know. So while he couldn’t scare off potential suitors with just a look, he could take them five pitches off the ground to test their intentions. He and my mom raised my brothers and I in the Tetons. He used the park as a classroom: The Art of Epicing 101. He used the trails to teach us when to panic (when there is lightning), and when to stay calm (pretty much all the other hours of the day when there isn’t lightning). He taught me how to climb in the Tetons. He taught me how to go hours without food or water in the Tetons. He taught me that if I go the entire day without complaining, that I would be rewarded with ice cream in the Tetons. 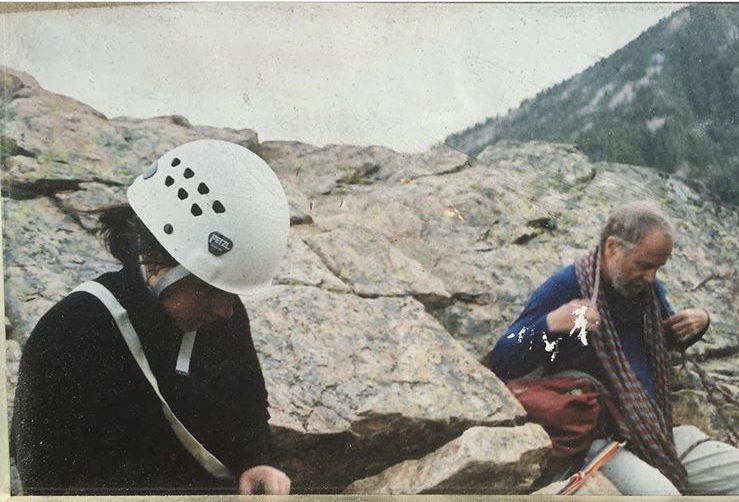 The syllabus was always hiking or climbing, the tests were always the summits, and the rewards were a set of skills that has translated into a lifetime of epic adventures. I love chairlifts. But as my ski career has grown, I’ve grown to love foot-powered missions as well. I would argue that there are few better places than the Tetons to hone your ski mountaineering skills. There are countless classic testpieces like the Grand Teton, the Northwest Couloir of Nez Perce, and the Apocalypse. These are ski mountaineering routes that see heavy foot traffic all winter long. But it’s the random unnamed couloirs that rise out of the many canyons that have captured my heart. Hadley Hammer is no stranger to getting "lost" deep in her backyard. By lost, she means booting up a big line with an even bigger smile on her face. Drew Smith photo. This past winter, my roommate and the fastest bootpacker on earth, Ben Hoiness, photographer Drew Smith, and ski-bum/North Face desk jockey Kaki Orr and I skied deep powder in one of these random couloirs in Death Canyon. We skinned across Phelps lake, saw a mountain lion, ate cookies, drank hot chai, and chased Ben up a waist deep bootpack. It wasn’t an epic line, not a line to add to your resume or something to brag about, but it was so damn fun. And that’s one of my favorite parts about Grand Teton National Park. It’s a place where you can always go get rad, no matter the season. But it’s also a place where you can enjoy mellow powder, dip into one of the drive up lakes, climb a mellow 5.8, or just stare at the view, beer in hand, at Dornans. It’s a true playground, and one that will bring out the child in you no matter what the adventure is. Backcountry skiing holds risk. Don’t go into the Tetons without being prepared. Buy the proper equipment, and more importantly, take an avalanche class before venturing out. Awesome blog.Thank you very much for sharing interesting articles here. This question how to on bluetooth in windows 10 was stucked in my mind.